How to Transfer Samsung Galaxy Contacts to HTML File? Home > Resources > Backup Samsung > How to Transfer Samsung Galaxy Contacts to HTML File? How to Backup Samsung Galaxy S9/S8/S7 on Computer? Thinking about putting your contacts from Samsung mobile phone to computer and save them as readable and printable format? Then, you must be in need of a tool to help you perform the contacts transfer. Search the web, you can see there are many methods available for help, but most of them are involved with Gmail and operations seems complicated. After you finish reading this article, you will see transferring contacts from Samsung to computer is a piece of cake. All that you need to prepare are a USB cable (or Wi-Fi network), a computer and Coolmuster Android Assistant. Android Assistant is the key here. 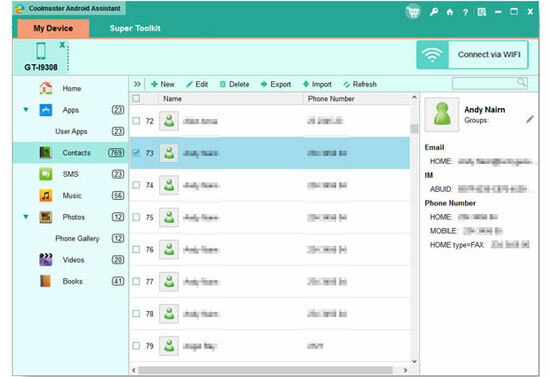 With it, you are able to copy complete information of contacts, including phone numbers, names, address and more to your computer and save them as HTML file so that you can choose to backup, view or print the contacts. The program also enables you to edit and delete Android phone contacts on computer. Coolmuster Android Assistant supports all models of Samsung phones, such as Samsung Galaxy S6/S5/S4/S3, Samsung Galaxy Note 5/4/3/2 and many more. Click below icons to download the software. For the first step, launch the installed Samsung contacts transfer tool on your computer and connect your Samsung mobile to the same computer via a USB cable or Wi-Fi. The connected Samsung phone will be detected by the program. Once detected by the program, all files stored on your Samsung mobile will be scanned out at the same time and you can preview them in categories on the left side column, including apps, music, photo, video, contacts, and so on. Choose the "Contacts" option and enter the "All contacts" folder. Select the ones you want to print and then touch "Export" to save them on your computer as HTML file. Thank you for reading this guide and have fun!